Young people from across Nine Elms on the South Bank have worked alongside artists and designers to get inspired by the local area’s fast moving regeneration programme. 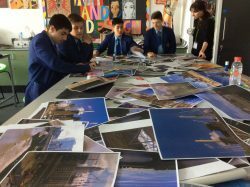 Architect Wendy Smith worked with secondary students from St John Bosco College to explore masterplanning with New Covent Garden Market. 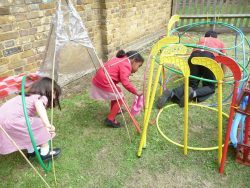 Jasper Sutherland, a communications and engagement designer from Make:Good created play structures with a class from John Burns Primary at a riverside site and got the children thinking about ways they would like to improve their area. Artist Anne Harild, worked with a class from Chesterton Primary to explore sculptural forms and architecture, looking at a site near Chelsea Bridge. The young people’s experiences with professional artists is part of the Cultivate programme, a creative learning project for children and young people. The initiative forms an important part of the wider place making effort which is turning Nine Elms into a new centre for arts and culture on London’s South Bank. The project which took place between May and July of this year, is one of a series coordinated by Cultivate, a creative learning programme for children and young people. Part of A New Direction (AND)’s London Cultural Education Challenge, Cultivate is supported by Wandsworth Council and the Nine Elms Vauxhall Partnership and part of the area’s regeneration programme. Cultivate acts as a bridge between schools and the cultural opportunities being created through the area’s, by co-ordinating and commissioning a range of exciting projects. One of Cultivate’s main aims is to creatively explore ideas about place-making in the changing urban environment and ensure that young people living in Nine Elms feel a sense of ownership and pride in the past and future of their area. Young people are finding out more about local arts, culture and place-making and through doing so, be inspired by the range of work and study routes in the creative industries. Each class spent three days, with their creative professional, observing spaces, making art, designing structures and learning about different place-making professions. They then shared their work with the rest of their school at special events. 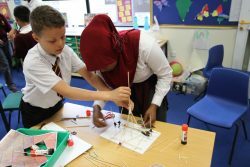 The London Enterprise Panel’s London Ambitions report recommends every child should have at 100 hours of ‘experience of the world of work’ during their school lives, and young participants in the project will be able to count this towards their total.